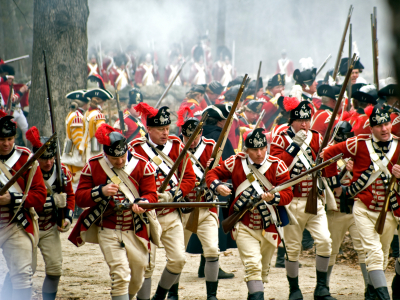 During the American Revolutionary War, the British Military brought centuries of European military engagement strategy to the battlefield. In Europe, battling armies would walk up in lines within 25-35 meters of each other, raise their muskets and fire at the enemy (who was doing the same thing at them). As soldiers dropped, ranks behind the first line would replace them. I suppose who won was based mostly on who showed up with the most disposable combatants. Before muskets, the front line would be the pike carriers. Same thing…engage frontally and be replaced by the rank behind until somebody hollered “Uncle”. Bear in mind this was the definition of a military infantry battle. This was the “rule”. It was “how battles were fought.” A composite Knower/Judger of military strategy, if you will. In the late 18th century, the British military was called upon to put down a minor rebellion in the American colonies. The combatants in the colonies already had 200+ years of battling with the Native Americans. Their Learner/Researcher personas had long ago abandoned the Old World tradition of standing there and getting an arrow in one’s chest. These natives were quite successful when confronted by early settlers attempting to do battle in the European custom. So the settlers adapted. They, like the Indians, learned to hide behind rocks and trees. They learned to shoot accurately and take cover in order to have an opportunity to shoot again. How “revolutionary”…more than one shot per combatant! OK…I’m a little tongue-in-cheek here. But my point is this. By the time the Colonists were drawn into combat with the British regiments, the two K/J mindsets were polar opposites. Because they were stuck in a K/J rule of European combat, the British actually accused the Colonists of unfair combat! Meanwhile they got picked off like chickens on a fence. The battles in which they prevailed were mostly due to overwhelming manpower. They did suffer tremendous casualties, however. So whose musket fire are you walking into? Why? Because that’s the way it’s always been done? Maybe a little Learner/Researcher data can put you in a position to get at least one more shot before……..
Kim DeMotte – Corporate CoDriver has developed tools and programs for teams who value increased trust, understanding and camaraderie Call him at (877) 245-8251. « Corporate CoDriver: Why do any of us have to buy into this crap?